Stop right now, I can't handle the deliciousness and ease of this recipe and I am so excited about life, not to mention to share this recipe with you. I love love love bread (like Oprah) but I'm not going to lie, it makes me bloated AF, and I am all about living a life on purpose and don't want to be feeling nasty in the process. Know what I'm sayin'? Hence why I created this little wonder, this is legit power bread, super high in protein, low in sugar, and will leave you feeling satisfied. 2) Mix together all the dry ingredients including the seasonings. I just use a whisk, but if you'd prefer to put them in a food processor you can do the whole thing in there. 3) Add the eggs, oil, honey/agave and apple cider vinegar and stir or blend it all up. 4) Pour your beautiful, paleo, non-bagel batter into a "7.5 x 3.5" non stick loaf pan. Bake at 350 for 40 minutes. I didn't have a loaf pan so I used a "9" cake pan and baked it for 30 minutes. 5) Cool that baby, and serve. Enjoy enjoy, and let me know what you think! Truth time, even for a meditating, essential oil slinging, mala wearing yogi, mornings can be rushed. Which is why I was inspired to create this super easy, extra tasty morning snack. I like to work out in the mornings which is why I don't eat much, because honestly, who likes to jump around or twist with a bunch of food mushing around.? Any who... This breakfast bark is super simple and will be a quick pick me up as you're running out the door. Check it out. 3) Spread the 4 Cups of Greek yogurt on the paper about 1/2 an inch thick. 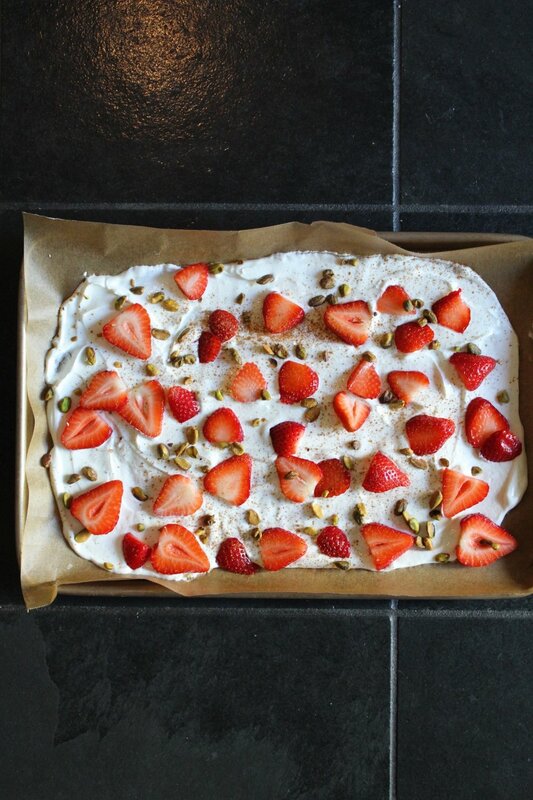 4) Sprinkle your strawberries and pistachios over the yogurt and drizzle a bit of honey and cinnamon on top. 5) Put this lovely concoction in the freezer for 4 hours, or until it's solid. 6) Break it up into various sizes, so you can grab it on the go! Texture is muy importante (to me) when it comes to food. So I thought I would offer you a new type of brussels sprout that will make you want to gobble them up on the regular. I mean, I love them anyway, but this simple and delicious approach gives me a craving that is something serious. Also, who has 40 minutes to wait for these bad boys in the oven? .... Ain't nobody got time for that! 1) Put your cup of oil in a medium sized pot and crank up the heat to a medium/high setting. 3) When the oil is at a low boil, mindfully, using a slated spoon if possible place the 1/2 of the sprouts in the oil and watch them brown. It can happen pretty quick, so stay conscious. Also, be cautious of splattering oil, it is indeed a thing, so step back while you wait. 4) When the sprouts have lightly browned and become crispy, use your slated spoon to remove them. Kindly place them on paper towels to remove the excess oil. I usually dab them off a bit. 5) Do the same routine with the other half of the sprouts. You don't want to over crowd them in the pot, hence why we do 1/2 at a time. 6) Once they are all crispy and glorious, add sea salt to taste, and add a zest of lemon to the top. Again, how much is up to you, but that extra little tang adds a certain something.